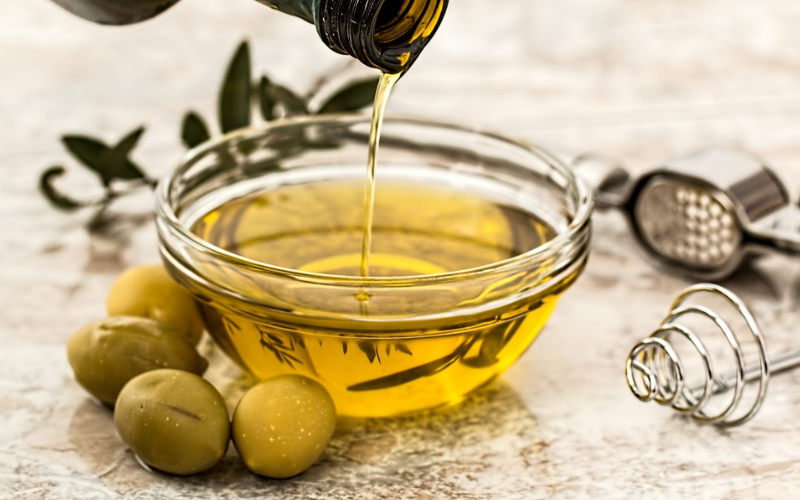 After my husband and I decided to begin eating healthy, we made a quick switch to olive oil after finding out the great benefits of it (and the dangers of many vegetable oils like canola). In our world today, olive oil is known to be a healthier, better quality oil. But exactly what is olive oil? Olive oil is literally the fruit juice of olives. Seriously! How cool is that?! How do we get orange juice? We apply pressure to the oranges until the sweet juice spills out of it. That’s exactly how olive oil is made. Of course, there are more processes to ensure all oil is used from the olives. However, this yummy stuff contains a bunch of antioxidants and fights inflammation throughout the body. After the olives arrive at the facility, they are pressed on a machine until the texture is a paste. Then, the oil is separated from the watery substance in the paste. There is no heat involved in this step. (Otherwise known as cold pressed oil.) The high quality oil from this first press is called extra virgin olive oil. Any oil that does not meet extra virgin qualities have the opportunity to become virgin olive oil. If the acidity is below 2%, it can pass as virgin. A lot of different factors affects the quality of olive oil. Everything from how ripe to how healthy the fruit was. Non-virgin (pure) olive oil is what’s left after all the great quality oil has been removed. It’s a lower grade oil because it’s been pressed repeating, cleaned with chemical solvents, and refined. After it’s been used and abused, a small portion of virgin olive oil is mixed with it to restore some flavor and color. Believe it or not, there’s still some lower quality oil left. This is called light (or sometimes extra light). It’s been refined like heck and there’s barely flavor and color in it. With all these different varieties, how on earth are we supposed to know which ones to buy at the store? Well, there’s some key words give away the goodness of an oil. Let’s go over the four types of olive oils again. Premium grade A: Extra virgin olive oil (EVOO). The highest quality olive oil you can find is extra virgin. There are high standards set in place for what can be labeled as extra virgin. These include having an acidity level under .8% There was no heat involved in making this oil, which is awesome since heat destroys a lot of the benefits of olive oil. Also, no chemicals played a part in its creation. Thumbs up! Since the process of creating high quality extra virgin olive oil takes a while (including testing and certifying), the price of this oil is not cheap! Grade B: Virgin olive oil. This oil isn’t horrible. The acidity levels have to be under 2% and it wasn’t exposed to high heat temperatures. It just didn’t make the cut to be extra virgin. Grade bad: Pure olive oil. Pure is a mixture of both process and premium olive oil. It’s been through the ringer and is better for baking and deep frying. A lot of the great qualities of olive oil has been killed off, so it certainly shouldn’t be a first choice. Grade Worse: Light and extra light olive oil. All the oil that came out of the olives, and this is the leftovers. However, since it’s been through such high heats it can be used for frying. Pressing or sell by date: Olive oils should have a date of when they were created or at least when they should be sold by. Olive oil does not last forever. On the contrary, try to use the bottle you have within a month. The longest it can last is a year if you keep it away from heat or light. The darker bottles can help keep your oil fresh for longer. Cold pressed: You always want to look for cold pressed if you want a higher grade of oil. Although heat allows the producers to extract more oil, it kills the wonderful scents and flavors. Look for a country: Don’t just look for a produced by label. Look for an label that indicates it was grown, harvested, and created all in the same country. Pure and light: refined, heat treated oil. Also, it’s full of impurities with a hint of EVOO. Taste: The best way to depict what quality the oil is to taste it. Try to find a store that will have olive oil tastings. Some tastes you can find in premium olive oil is herbal, buttery, fruity, spicy, floral, and nutty. It should always taste fresh and clean. P.S. Color doesn’t matter. All things can factor into a color of an oil. A color itself is not good enough to be an indicator of quality. Take a look at this extra light olive oil. See the difference? It clearly states it’s good for frying and you can see the color is extremely light. The look is totally different and you can tell it’s been refined. Did you see how low the price is? I’m 100% you will begin to find the best olive oil for you and your family after reading this. Tell me, do you enjoy olive oil? What do you use it for? Also, what other oils do you enjoy? Leave a comment down below. Thanks for stopping in! Olive Oil is one of my favorite things to cook with/season with! Thank you for the share!